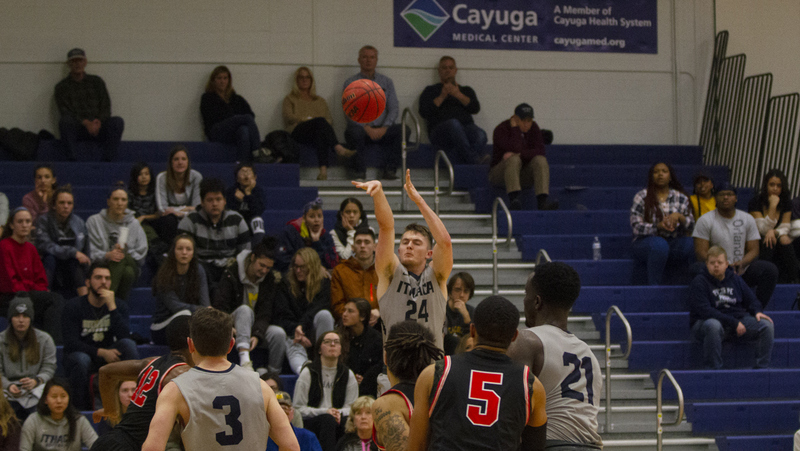 The Ithaca College men’s basketball team defeated Clarkson University 97–67 on Feb. 8 in Potsdam, New York. The win improved the Bombers record to 13–9 overall and increased their winning streak to five. 28–19 lead at the midway point of the first half. The Golden Knights refused to slow down as they responded with 11 points to the South Hill squad’s two, cutting the lead to two points with 4:37 remaining in the half. The teams traded points until Clarkson were able to obtain a 38–36 lead with 1:48 remaining in the first half. This would be the Golden Knights last lead in the game. A technical foul by Clarkson junior guard Matt Higgins on junior captain Riley Thompson led to a pair of layups and a 45–39 halftime lead. The second half would be all Blue and Gold, as they erupted for 52 points in the second frame. The Bombers were able to pull away when they took a 51–41 lead off of a three pointer by junior guard Sebastian Alderete. Clarkson showed some life by scoring the next five points to cut the lead to five, but the Blue and Gold took control from that point on. They built up leads of 16, 20, and eventually settled into the final 30 point lead to emphasize the blowout. The South Hill squad’s final total of 97 points was their most scored in a game since November 17, 2017, when they dropped triple–digits on SUNY Canton. The Blue and Gold were led by Alderete, who chipped in 25 points with seven rebounds and four assists. Thompson contributed 23 points, while senior forward Peter Ezema added 18 and freshman guard Skylar Sinon scored 16.